One of my favorite comfort foods that’s perfect for a cold winter night is chicken pot pie. I grew up eating the stuff and I just love it. But with such a small family, I like to cook large meals so that I can save leftovers for a second meal. 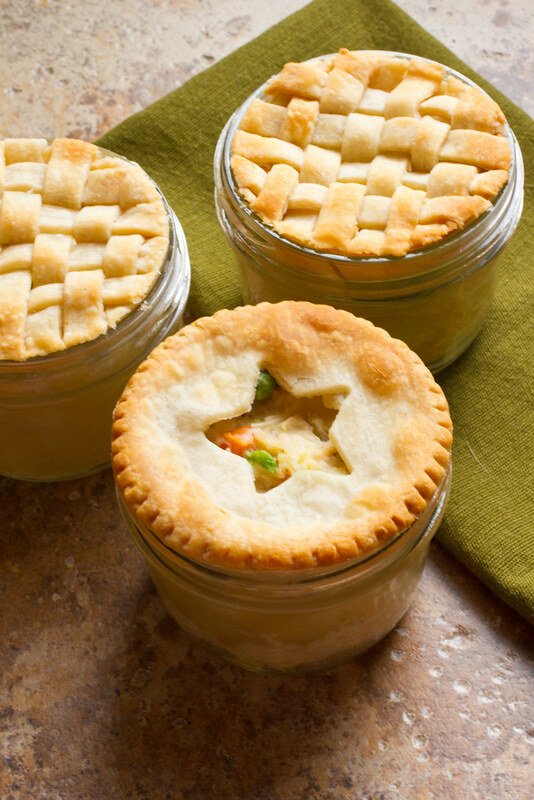 These Mini Chicken Pot Pies are made in small, wide-mouth mason jars so that you can put the lid on them and freeze them for a later date. 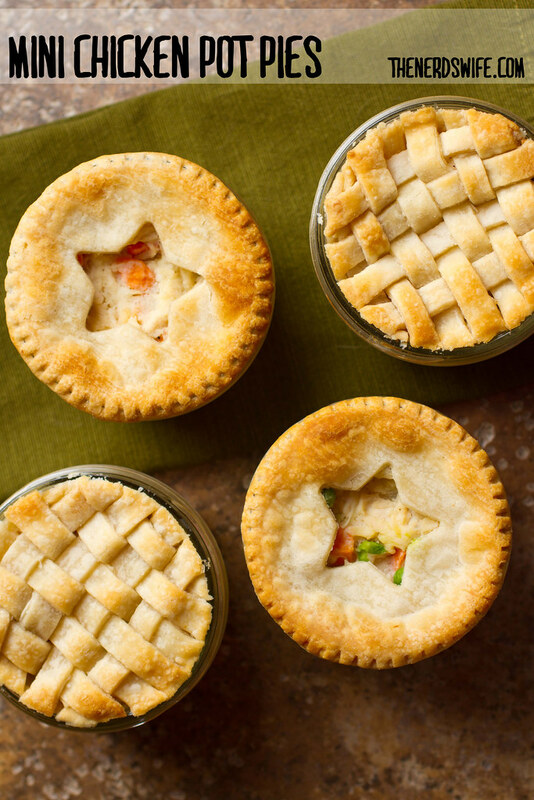 Just pull out how many pies you want to make and put them right in the oven. The jars are designed for canning and can handle extreme temperature changes without breaking. Plus, they’re really cute so you could serve them if friends come over! Preheat oven to 425 degrees. Prepare jars by washing and drying. Cut each of the pie crusts (there are four total) into quarters. Press each quarter into a jar, making sure the crust completely covers the jar. In a large skillet over medium heat, melt butter. Add onions and sauté for two minutes, until fragrant. Stir in flour, salt and pepper and mix well. Gradually add broth and milk, stirring continuously and cooking until thick. Add the frozen vegetables and cook for a few more minutes, stirring continuously. Add in the chicken. Spoon chicken mixture into the prepared pie jars, filling to the brim. 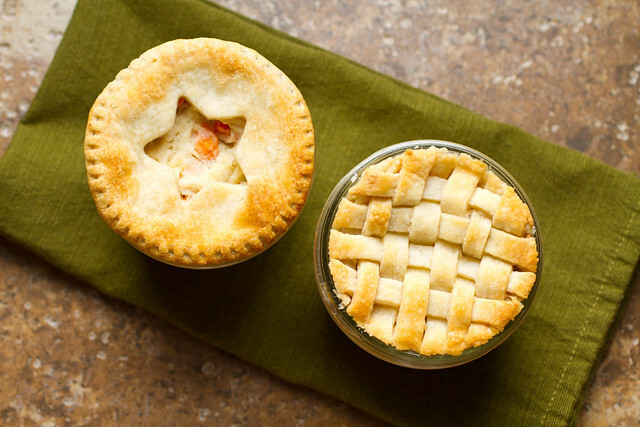 Top with the remaining pie crust quarters, using the tops of the jars to cut the dough to size, or creating a lattice pattern using thin strips of dough. Remember to make sure there are vents in the tops of the pies if you don’t use the lattice pattern (it will have vents on its own). Bake 15 minutes until crust starts to turn golden brown. Cover in foil and bake another 15-20 minutes.